Today did not really go to plan for my client; but we did get four good sessions in before Lunch. Here today at Oulton but wet again. Coaching one of the EDI 400 Championship competitors. 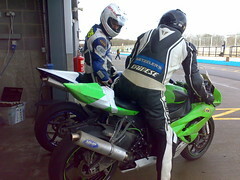 1st motorcycle coaching day of 2011. Of the season. It was very, very cold and very, very wet. But Mark had come to Cadwell all the way from Essex and he was certainly not ready to go home too early! Race plans for this year. 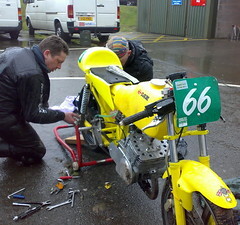 The bike is competitive, but the machine owner needs 'running money' to get us to all the events and keep the bike maintained for the season. 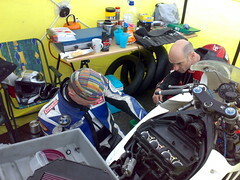 It would be great to get back on track with my old supersport racing 'Chum' Ian Simpson who is the current ICGP champion. Additionally, I really fancy a crack at the Ducati 848 one make championship - with a couple of European events, and the majority of the rest being in support of the BSB rounds, I think I could really put up a decent showing, and the championship should get plenty of media coverage. So, there you go - that's what I fancy doing, now all I need is to find the sponsorship support to do it! 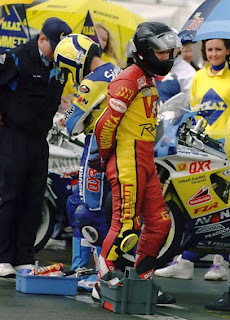 Photo of me and Simmo years ago is by Graham Etheridge. Mark is just showing me this gorgeous 600 he's built for BSB Superstock.